1. to facilitate exchange of information and best practices and build synergy between local civil society organisations with decision-makers. 2. to raise the profile and the visibility of innovative policy and practices of local actors on the global scene. For the number 5, Violaine HACKER has invited Ioan Negrutiu and the Michel Serres Institute. "Indeed security and sovereignty issues,conflicts and geo-politics depends on natural resources. Besides,as explains Pr Ioan Negrutiu, ‘the coordinated and integrated management of natural resources at the regional scale is likely to become an important political issue in the short run’. Thus ‘the dominant economic thinking has a serious handicap, namely theincapacity to put the economy within the limits of the biosphere’. The ambition of the Institute Michel Serres is to fostera participative, pro-active civil society acting to manage human activities while meeting the specific territorial potential and resource capacities and ensure a fair re-allocation of such resources according to fundamental social needs and coherent long term public good policies... Oh ! 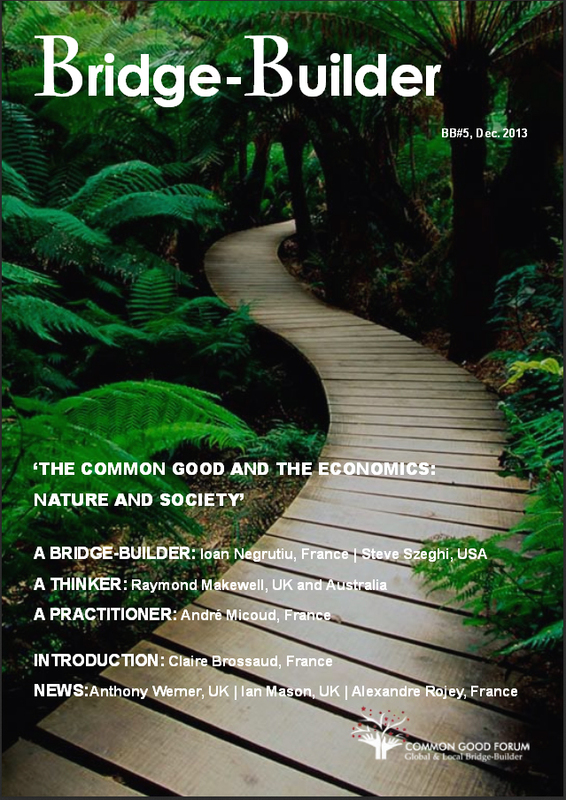 That is both the philosophy of the common good and the ability to Build Bridge !!!"